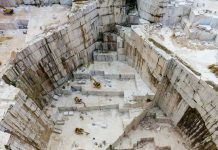 How Brexit has influenced United Kingdom’s imports of finished marble and granite products? 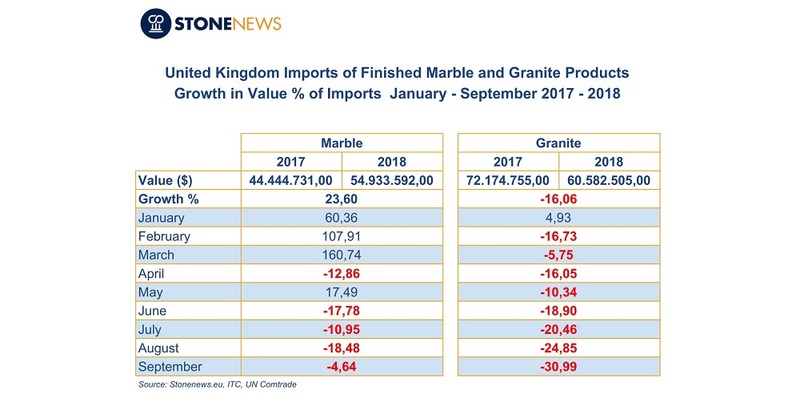 Stonenews.eu,after studying the statistical results* of the International Trade Centre, the UN Comtrade and the National Statistical Institutes, is presenting United Kingdom’s imports of finished marble and granite products in the first nine months of 2018 as well as the corresponding changes compared to 2017. 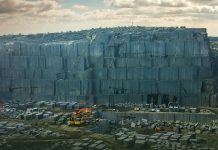 Rapid political developments in the UK cause legitimate concern to suppliers of finished marble and granite since they see their exports decline at a particularly high rate. The statistics for the first nine months of 2018 confirm the downward trend in imports, especially those of finished granite products. At the following table we can see the imports of finished marble and granite products in the first nine months of 2018 and the corresponding changes compared to 2017. As shown at the table, in the first nine months of 2018, the value of finished granite imports declined in total by 16,06%, compared to 2017, opposite to finished marble imports value that increased by 23,6%. However, the table shows that from June to September 2018 the value of finished marble imports has been steadily declining. Between January and September 2018, the value of finished marble imports fell by 38.73%. 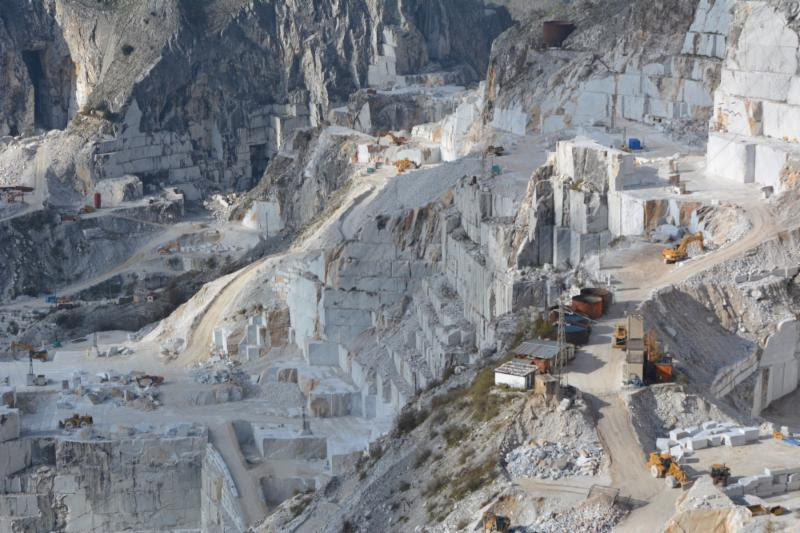 The UK’s main suppliers of finished marble in the first nine months of 2018 according to import value were Italy with a share of 23.54%, Turkey with a share of 19.48% and China with a share of 15.54%. Imports from Italy in the first nine months of 2018 had an increase in value by 95.5%, in quantity by 38.55% and in price per tonne by 41.14%. On the other hand, imports from Turkey showed a fall of 34.95%, 29.04% and 8.33% respectively. Imports from China also dropped, having a 10.49% decline in value, 8.13% in quantity and 2.56% in price per tonne. The statistics above show that the total increase in the value of finished marble imports is due to Italy. Generally, the United Kingdom since 2016, when Brexit was decided, has been increasing imports from Italy, showing preference for the highly-valued Italian marble. Typically, the price per tonne in the first nine months of 2018 stood at $ 2,963 while the equivalent in 2017 was $ 2,100. 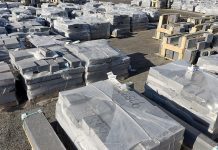 The UK’s main suppliers of finished granite in the first nine months of 2018 according to import value were India with a share of 43.79% and China with a share of 33.49%. Imports from India in the first nine months of 2018 had a 17.94% drop in value and a 20.72% drop in quantity, while the price per tonne increased by 3.5%. Imports from China also fell, showing a 7.03% decrease in value and a 19.62% decline in quantity against the price per tonne, which increased by 15.66%. From the above, it is clear that the United Kingdom, despite the decrease in import value and quantity, imported finished granite products at a higher price.